Johnny Rocker is back! My father's day present was tickets to a Bluefish game. We had 3 really nice surprises at the game today. 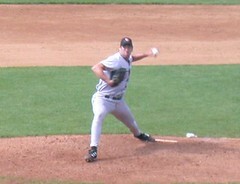 The first (and best), was John Rocker coming in to pitch and getting no one out before being yanked. He was pissed - threw his glove, but none of it helped him get anyone out. The side note is that the guy can still bring major heat. Secondly, the son of Pete Rose played 1B in the game - you can click Rocker's pic to get to the Rose pic - nice bonus. Third, the Bluefish had a promotion where kids under 12 got to run the bases after the game and get some ice cream. It was fun to see my girls rounding third, heading for home!